Jukka Ruoskanen has scanned his best halo slides ( 1 ). The material spans from year 1988 to 2005 and includes several displays of interest. Some cases are rather puzzling, like the one shown above, photographed on 23 December 2001. 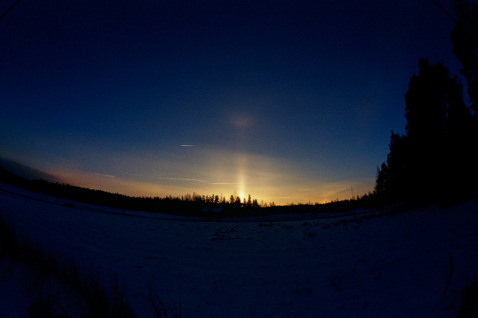 It contains strange pillars next to sun pillar. Explanation for these arcs is not known. Congratulations, Jukka! 20 years of halo-history. You have a wonderful collection of exciting phenomena! Fantastic collection! I dream of having in Poland even though a few photos like these. Congratulations! Thanks guys. I noticed a while ago, that I have a bunch of halo slides that only maybe a few people have ever seen. So I decided to scan some of them and make a web gallery so that they are available to halo people to see. Actually, I had an idea to scan some of the best displays already years ago, but since it is a very time consuming task it took a long time to complete. Now that it's finally there I'm glad you enjoy it! Yeah I like your homepage a lot I think the odd radius halos, elliptical and the displays with the wegener arcs are my favorites on the page showing halos from 88 to 05. Nice collection of halos, Jukka! You have many cases of odd radius halos. And you are probably the only person having photographed a Wegener arc in France!